Minecraft is such a wonderfull game - wonderfull enough, in current times it is available not only for PC computers. Minecraft is also available for other systems and platforms. One of those other systems and platforms is Minecraft for Android - Minecraft Pocket Edition, available on Google Play. With Minecraft Pocked mobile edition for iPhones, iPads or tables or for Apple products you can play your favorite Minecraft game everywhere you are! 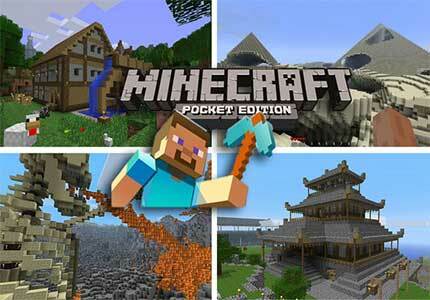 Minecraft Pocket Edition for Android is on the very similar rules to Minecraft PC version. Here you can also have randomly generated worlds. You can play multiplayer over a Wi-Fi connection network. Modes in the Minecraft Pocket Editions are also similar to the main Minecraft PC game - you have here also Survival and Creative modes. You can play Minecraft Pocket Edition as long as your battery still alive in your favorite mobile device. Minecraft for iPhones, tables, iPads, smartphones with Android, cellphones and all other Android mobile devices. With this version of Minecraft you can really get a lot of benefits from your favorite game!